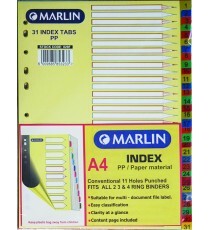 Product Lead time: 2 to 4 working days File dividers/indexes made from paper material & marked from 1 to 31. 11 Holes punched - fits all 2,3.. 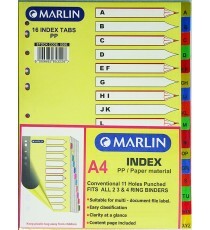 Product Lead time: 2 to 4 working days File dividers / indexes made from PP paper material marked from A to Z. 11 Holes punched. 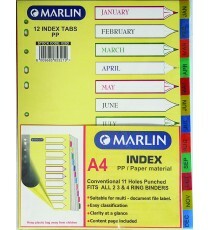 ..
Marlin File divider/indexes - Jan. to Dec. 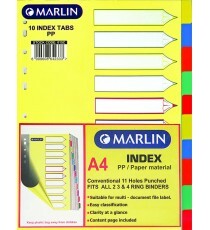 Product Lead time: 2 to 4 working days File dividers / indexes made from PP / paper material & marked from Jan. to Dec. .. 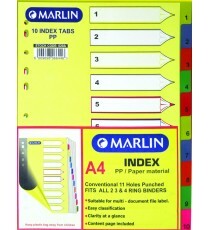 Product Lead time: 2 to 4 working days File dividers / indexes made from PP/paper material - 10 position, blank. .. Product Lead time: 2 to 4 working days File dividers / indexes made from PP/paper material & printed from 1 to 10. Content page i.. 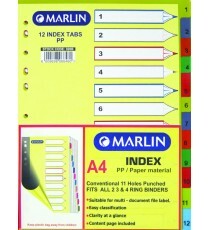 Product Lead time: 2 to 4 working days File dividers / indexes made from PP/paper material & printed 1 to 12. Content page included. &nbs.. 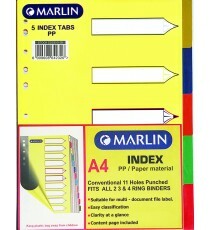 Product Lead time: 2 to 4 working days File dividers / indexes made from PP/paper material - 5 position, blank. Content page included. ..